The World's Largest Vessel Enters The Water In South Korea : Parallels Shell's new vessel is so large that if you stood it up, it would be taller than the Empire State Building. It will be anchored 300 miles off the coast of Australia to handle liquefied natural gas. 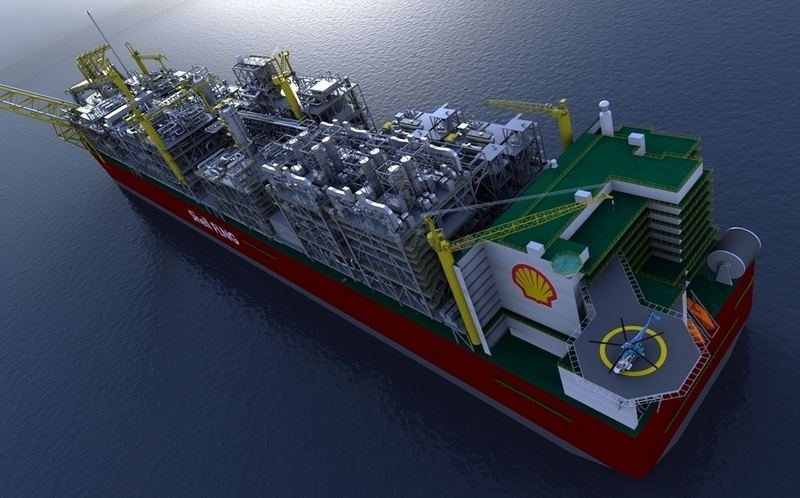 A rendering of the world's largest vessel, the Shell Prelude, which comes in at just over 1,600 feet. It has just left its dry dock in South Korea, where it is being built. It will eventually head toward Australia, where it will be anchored off the coast and used as a liquefied natural gas facility. Shell has just floated the hull of the world's largest vessel out of its dry dock in South Korea. It's so massive that if you stood it up, it would be 1,601 feet tall, reaching higher into the sky than the Empire State Building. The vessel, called the Prelude, will actually be used more as a floating island than a ship. It won't be able to travel under its own power. Shell plans to tow it and anchor it about 300 miles off the coast of western Australia for 25 years. There, the 600,000-ton Prelude will serve as a liquefied natural gas, or LNG, facility, which lets the company tap into the natural gas deep at sea. The gas will then be chilled into a liquid, which makes the gas easier to store and ship. Smaller ships will come and pick up the natural gas and transport it to customers. Shell's Prelude is so huge it can store enough liquefied natural gas (LNG) to fill 175 Olympic swimming pools. It will stay in place during stormy weather and is built to withstand a Category 5 cyclone, according to the company. The Prelude will allow Shell to tap into natural gas reserves that have previously been too expensive to extract, according to Kayla Macke, a U.S. spokeswoman for the company. She declined to comment on the cost of the drilling project, but noted that Samsung, the South Korea company that built the Prelude, put the cost of the vessel at $3 billion back in 2011. Previously, the world's largest vessel was the Jahre Viking, an oil tanker that's 1,504 feet long, according to Guinness World Records. Macke says the Prelude will be similar to the offshore rigs in the Gulf of Mexico, adding that there will likely be around 100 workers who will perform two-week shifts at sea before heading back to shore. Energy companies are increasingly going far offshore for oil and natural gas. The Malaysian national oil company Petronas is also building a floating natural gas facility, though at a little under 1,000 feet, it won't be nearly as big as the Prelude. The U.S. Geological Survey, in a report last year, estimated that there are large potential reserves of oil and gas in the oceans of southeast Asia, off the coast of Australia and around Cuba. The Wall Street Journal reported last month that deep-water drilling is the "next big frontier for oil and natural gas production." Australia could be a big winner. By 2020, the country is projected to more than double its gas production of 49 billion cubic meters (1730 billion cubic feet) in 2010, according to this year's gas market report from the Bureau of Resources and Energy Economics in Australia. Earlier this year, the Economist noted that by "eliminating pipelines and other onshore costs, floating LNG production may prove the blessing Australia needs to stay in the gas game."